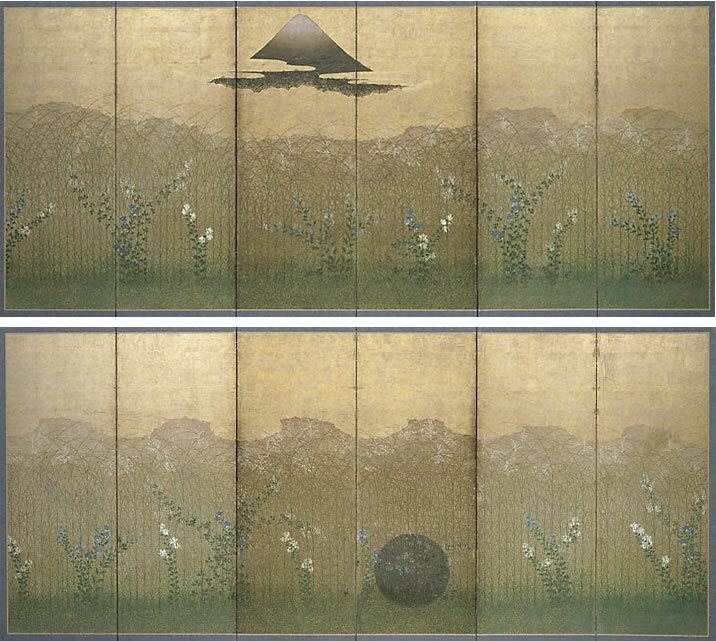 Screens depicting Musashino are one of the great classical subjects of Japanese art. In Japanese painting there is a specific category (called 'meisho-e', literally 'famous places') for the most revered places, which are usually those immortalised by famous poems and/or literary tales. Such a place is Musashino: every Japanese responds to the poetic associations of Musashino which appears in Chapter 12 of the famous Ise Monogatari (Tale of Ise), a 10th century collection of lyrical episodes. In Chapter 12, a man kidnapped a young woman and concealed her among the grass of Musashino when they were pursued by the provincial governor. As the governor was about to light the grass to flush out the lovers, the young woman wrote a poignant 'waka' (particular Japanese poetic form): 'Please do not burn the fresh grass of Musashino. Both he and I are hidden within'. Behind which the moon disappears. The Asian Collections Art Gallery of New South Wales , 'The aesthetic of transience', Sydney, 2003, 204-205 (colour illus.). The colour illus. on page 205 is a detail of this work.